Cultural differences? Certainly. Differing attitudes towards risk? Perhaps. But at heart, the debate over cheese is a debate that should be resolvable with recourse to the facts. Is cheese actually risky during pregnancy? If so, how risky? Here’s the conventional wisdom from a typical parenting website: “Is it safe to eat soft cheese during pregnancy? That depends on the cheese. If the cheese is made from pasteurized milk, it’s fine. But some cheese is made with raw (unpasteurized) milk, and it’s not safe to eat or drink anything made with raw milk during pregnancy. Most cheese sold in the United States – including soft cheese – is made with pasteurized milk and is therefore considered safe to eat. But some cheese made from raw milk also shows up on store shelves and at farmer’s markets, so it’s best to check the label before eating any. (Sara R., Genetic Counselor)” Who knows, perhaps she’s right about the cheese, but why exactly has a genetic counselor been nominated as an expert on the prevalence of bacteria in a food product? Next we’ll be asking our pharmacist for help with buying a used car and our lawyer for gardening advice. Enough of this silliness. Cheese and other dairy products earn their reputation as risky foods because they could be contaminated with a type of bacteria called Listeria. Listeria infection is extremely rare, but the bacteria has a creepy predilection for infecting pregnant women; and unlike most bacteria, it can sneak past the protective barrier of the placenta and attack the fetus. So while it barely registers on the list of common pathogens (there are a full 24 other foodborne infectious diseases that are more common than Listeria), it causes by far the most fetal deaths each year. Deli meat clearly emerges as THE single biggest hazard from Listeria facing the pregnant US population, simply dwarfing all others. 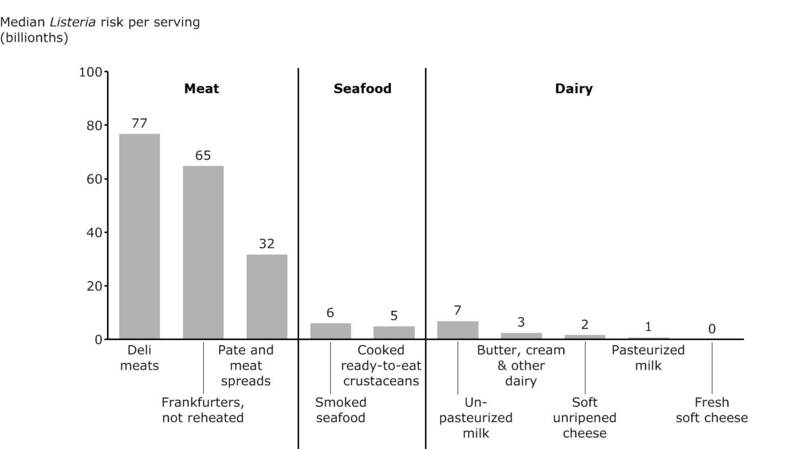 No other food category even comes close in terms of importance, with deli meat representing 89% of cases, or over 8 times the risk of all other foods combined. So if you want to avoid Listeria, you simply need to heat any meat before eating it. 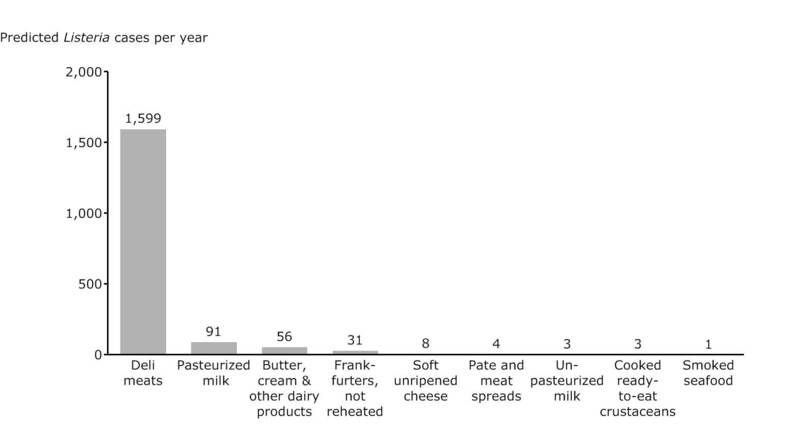 As a final aside, the second most dangerous food is ordinary pasteurized milk. Milk has a relatively low risk per serving, but is consumed so frequently that cumulatively, the risk is higher than for other less common foods. So if you still insist on obsessing about your dairy products, it should be your morning bowl of cereal, rather than the occasional restaurant cheese plate, that makes you think twice. Note: In the charts above, soft unripened cheese includes cheeses such as cottage cheese, cream cheese and ricotta. 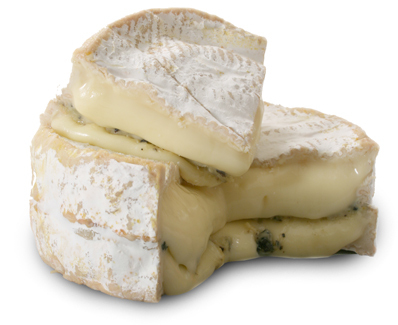 Fresh soft cheese includes queso fresco, queso de Crema, and Queso de Puna. Many categories have been left off as the bars wouldn’t even show; the list includes Frankfurters (reheated), Preserved fish, Raw seafood, Fruits, Dry/semi-dry fermented sausages, Semi-soft cheese (blue, brick, Monterey, muenster), Soft ripened cheese (brie, camembert, feta, mozzarella), Vegetables, Deli-type salads (fruit, vegetable, meat, pasta, egg, or seafood salads), Ice cream & other frozen dairy products, Processed cheese, Cultured milk products (yogurt, sour cream, buttermilk), and Hard cheese (cheddar, Colby, Parmesan), all of which have a risk of less than one case per billion servings. It was developed according to the following approach: “Listeria contamination data are based on 387 studies with over 346,000 samples…Expert advice on scientific assumptions was actively sought from leading scientists from academia, industry, and government…In addition, the risk assessment was initially published in draft form and public comments sought for six months.” The authors of the report must have been anticipating some seriously heated debate; or perhaps this is simply how the government always conducts its research. At least we can conclude they have done their homework.